The Wells Fargo Foundation recently awarded an $8,000 Foundation grant to UNC to support the agency’s Youth Arts Programs. The programs include a wide array of free after-school classes such as photography, theatre, dance, painting and music recording offered to teens at the agency’s Oppenheim Center for the Arts in West Scranton. 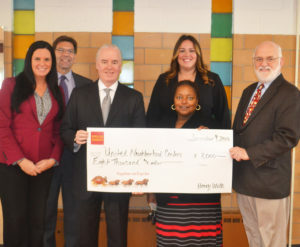 Pictured at the check presentation are (from left to right): Maria Kelly, district manager, Wells Fargo; Michael Pany, community development officer, Wells Fargo; Greg Collins, area president, Wells Fargo; (front) Angel Atell, director of community youth, UNC; Tara Brady, customer experience leader, Wells Fargo; and Michael Hanley, chief executive officer, UNC.